Yeah, yeah, I decided to stream. Basically, what this stream is about,is I have made an original geometry male and female figure, and lots of props for them. I load in the figure in DAZ Studio, and load in the props, then I take the result in ZBrush and sculpt on clothing, armor, hair, and the like, and convert it into a tabletop miniature you can print on a home 3D printer. Very often, I'll take requests from the audience, as well, to determine what to make. The primary stream is on Sundays, at 8 PM Central US time. 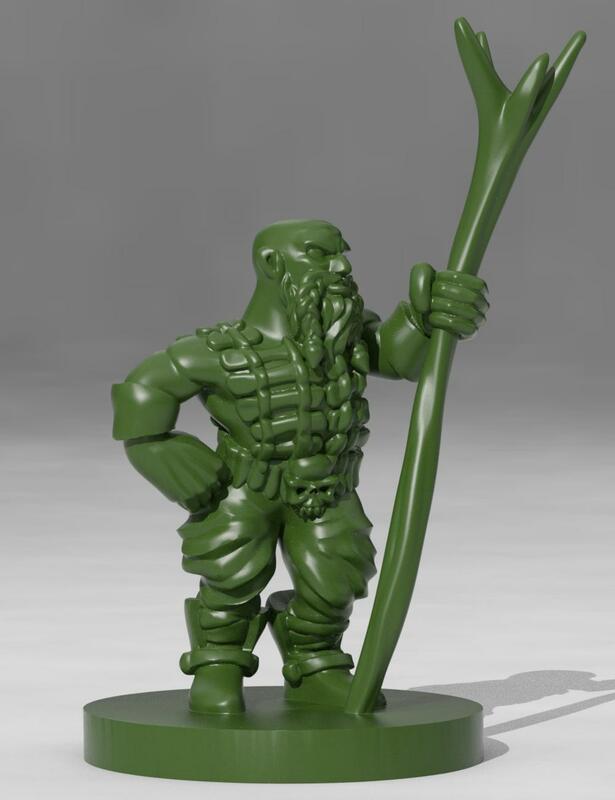 On Sundays is when I usually sculpt a full figure, and the result will be available as a free download on Thingiverse. Thursdays at 8 PM Central Time is more of a 'utility' stream, where I make more props and weapons, as well as further FBM's for the figures to better represent other races, humanoid monsters, and the like. The address for the stream is: https://www.twitch.tv/valandarthered ; , and below are a couple sample prints of these miniatures. They are printed on a moderately inexpensive FDM printer, showing what you can do without a super expensive resin printer. Going live! Tonight's show is about making props for orc and barbarian weapons, and a bit about combining some of the existing dials to make a new dial. I'm so sorry I missed the stream. I would've loved to see it. I'm a big fan of your work. Good to know. I will check them out. So I didn't get the sergeant done, because I got him done earlier! But tomorrow night, I will be going whole hog, and sculpting a big, bada** Orc Big Boss, live on the stream! Glad I saw this! I will have to go check it out. I'm a big fan too and can't wait to see what you do. Erm... oops on the "tomorrow night" thing. I was thinking "next stream", instead of "Monday night", and my brain did a booboo. I’ve only had time to spend about an hour or so zipping through a couple of your videos, but it’s very enjoyable, thanks for sharing your talent. It’s fascinating to see how so creat your art and make it look so effortless. I own over 250 of your items here at DAZ and am always looking forward to see what you come up with. May I ask what printer you own, and if you’re ever printed one of your figures at a slightly larger scale, say three to three-and-a-half inches high? Thanks again for sharing your talent, I look forward to watching more as time permits. Thanks for the info, much appreciated. Looking forward to Thursday. I haven't had time to watch these, but it sure sounds like a lot of fun. Thanks for sharing your talent with everyone! Ha! Sounds like we win either way. Great show, I really enjoy watching how easily you seem to build such cool miniatures. Thanks again for sharing. Well, I've decided to move the Sunday stream to 6 PM Central for a few weeks, and see how things go... Going live in about 40 minutes or so. Still enjoying the videos very much, I especially liked the Tiefling Warlock and the Grumpy Ranger. I'm really impressed with the overall style of your creations. Have you ever considered using your generic male and female characters to create a coherent "universe" of models for DAZ? I think they'd be perfect for comic and slylized/semi-toon art and I'd snap them up in a heartbeat. A "Valandar Universe" would be awesome. I should note I'm still doing these... and the detail level has started ramping up!